Also - congratulations to those who took the trailing evaluation - trailing certificates were awarded to Phil J (Trailing I), Daniel R (Trailing I), Steve N (Trailing II), Michelle P (Trailing II), and Jason K (Trailing III). A big thanks to Adriaan for making the time to visit the northwest to share his expertise! 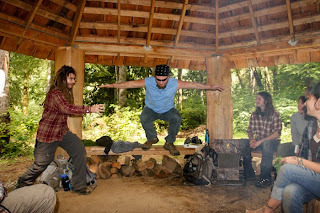 Here's some video clips of the first week of permaculture training during the 2010-2011 Alderleaf Wilderness Certification Program (taken by student & video intern - Jeff). 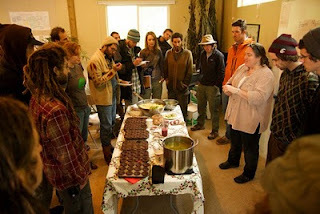 The class learned about permaculture principles and ethics, design concepts, sector & zones, as well as hands-on training in plant propagation (division, transplanting, layering, cuttings and seed collection) and garden bed preparation (sheet mulching, double-digging, and composting strategies). Thanks for the clips Jeff! 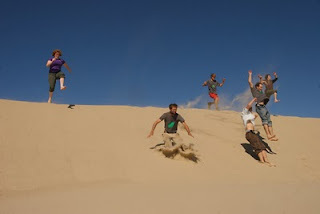 The Alderleaf Wilderness Certification Program Students just returned from their first week-long adventure in the Oregon Dunes! This trip is an exciting and excellent introduction into wildlife tracking and naturalist studies for the year-long students. Stretching over 50 miles long, the Oregon Dunes are an incredible wildlife hot spot that include forest mazes, wetlands and HUGE dune systems that can sometimes seem other worldly. The meeting of a variety of habitat types makes it very diverse, and the presence of sand makes tracking rich and exciting. 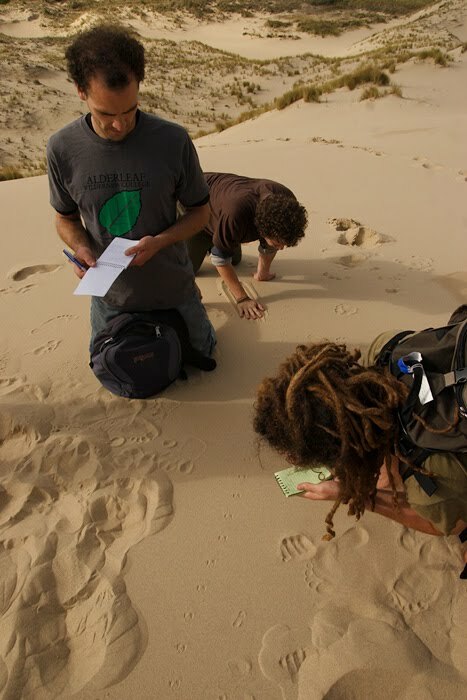 Here students Brandon, Jonny and Chris get down to the serious business of track identification and study. The story told by these little hopping tracks was a truly epic journey by a tiny treefrog across one of the biggest dunes in the whole area. It traveled at least a quarter mile across the open sand to reach a new area. What motivated it to move so far? Here student Matt shows off one of the mystery plants found along a fresh water wetland edge. 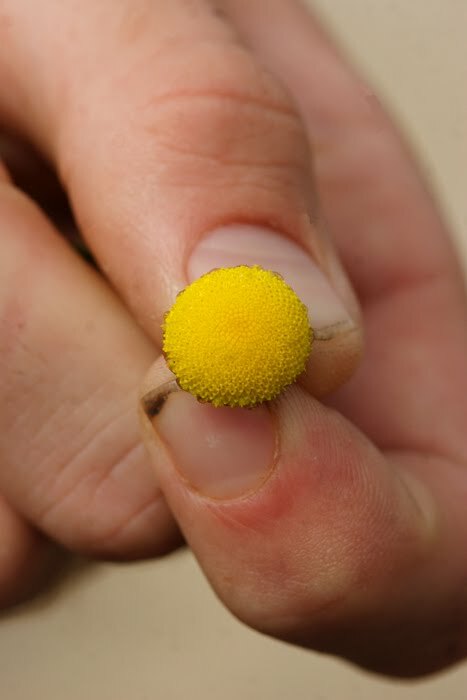 After some careful study, he figured out the identity of this lovely little yellow flower: brass buttons (Cotula coronopifolia). A fitting name for this petal-less, golden button of a flower. Its other name, "mud-disk" is also descriptive of its habitat preferences. Though the students were down to some serious naturalist studies, in such an epic natural setting it is impossible to not connect to the passions of a child. Overall, an incredible week of beautiful weather, great tracking and amazing animal encounters! 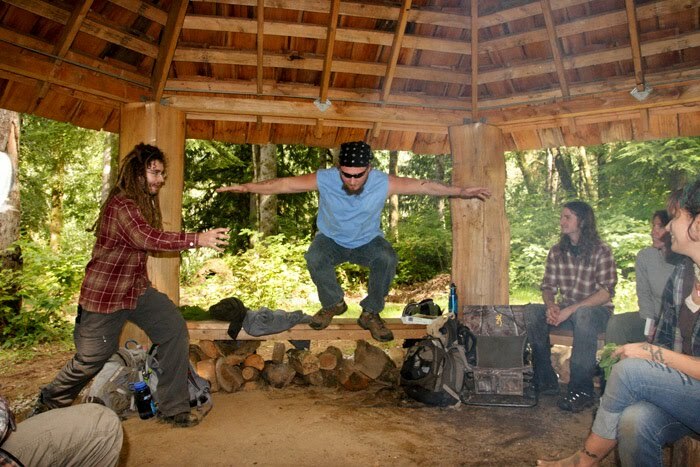 The first few weeks of the Alderleaf Wilderness Certification Program are underway, and the students have jumped right into their studies with gusto. 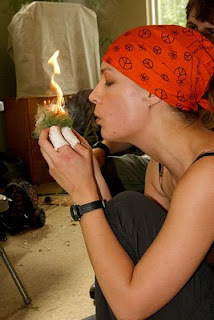 The students got to make their first friction fire kits, using the bow-and-drill method. It was inspiring to see so many students get their first coals and first friction fires of their lives. Here student Dannielle successful gets her first friction fire ever, even with added challenge of 2 bandaged fingers! On their first day with instructor Allen "Hawkeye" Sande, the students got to jump right into practicing teaching methods through the use of enthusiasm and some story-telling. Here two students, Chris and Brian tell the story of the first Northern flying squirrel. On another day, students had the great pleasure of being introduced to wild edible plants by Karen Sherwood. What better way to get to know them than through turning them into delicious wild edible meals?! 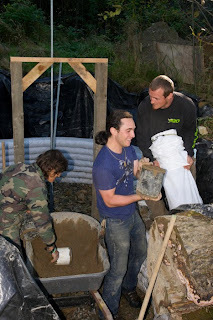 The Superadobe Root Cellar is growing! The Superadobe root cellar is taking shape! 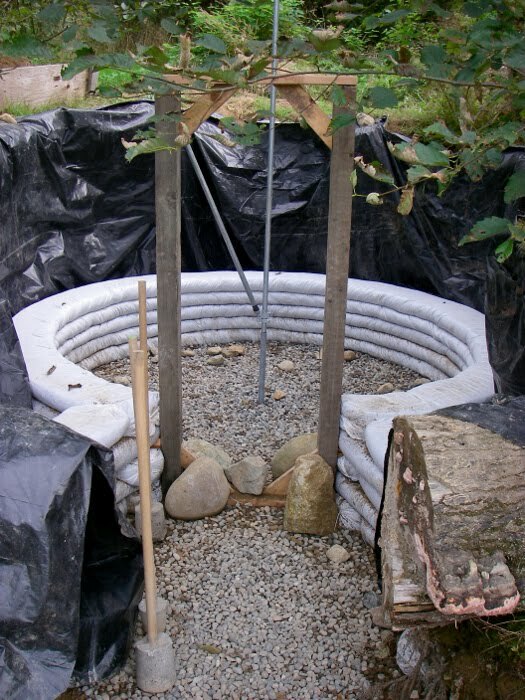 With the help of students, residents and staff it grows coil by coil. For those of you who might not be familiar with Superadobe construction, it is a method of natural building created by Nader Khalili. This approach is a modern form of adobe which utilizes bags of local soil in the form of coils which are stabilized with barbed wire between each layer. This method uses arches, domes, vaults and apses to create structural strength and beauty. Though, this method can be built into the more traditionally modern rectangular structures. Everyone involved is excited to see this project progress and move towards completion. Upon completion, this wonderful structure will be able to house a variety of edible goods from the Alderleaf farm without the need for refrigeration. It will also be another great example of a natural building utilized on the Alderleaf Campus. The Alderleaf Wilderness Certification Program has started a new school year and we are excited to welcome all of the new students. Say hello to the class of 2010-2011! Another fun and exciting school year with the Alderleaf Wilderness Certification Program is now underway.